If thou wouldst complete the diamond body with no out-flowing. Diligently heat the roots of consciousness and life. Kindle light in the blessed country ever close at hand, And there hidden, let thy true self always dwell. ~Carl Jung; The Secret of the Golden Flower. Brahman is life. Brahman is joy. Brahman is the Void. Joy, verily, that is the same as the Void. The Void, verily, that is the same as joy.The geometry of Vector Equilibrium is inferred from that of closest-packed spheres of equal radius. It just happens to be the geometry which underlies all matter since it is found in the nucleus of all atoms as sub-atomic force. Here, in the interior of the atoms, Newtonian physics does not apply. 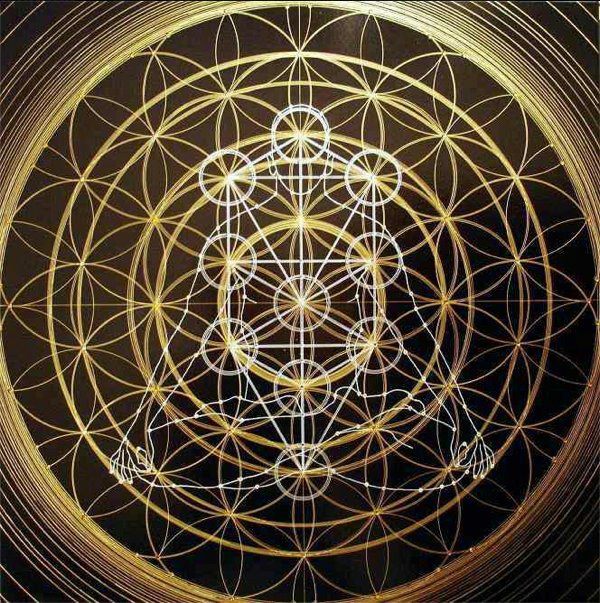 This sacred geometry system came down to us through Judaism and Hermetic Philosophy. It is one of the main currents of thought in the Western Occult Tradition. A mathematically accurate image of the Tree of Life can be constructed by dividing a vertical line into four equal lengths and filling in four intersecting circles, using a fourth of the line as radius. The nexus points are the positions of the 10 spheres, and connecting paths join the centers of the spheres. 2. Divide the line into four equal segments. 3. Using the segment length for a radius, inscribe four interpenetrating circles whose centers lie along the vertical line. These represent the Four Worlds, or Planes of existence. 4. The points-of-intersection are related to the numbers of Spheres on the Tree of Life as diagrammed 1 - 10. 5. With vertical lines (Red) join 3-5-8 for Left-Handed Pillar of Severity; join points 2-4-7 for the Pillar of Mercy. Line 1-6-9-10 forms THE MIDDLE PILLAR.6. The blue lines mark the paths between the Spheres.The spheres represent states of consciousness or ways of being, while the paths are ways of transition or change. It symbolizes all ways of being and becoming. Like the quantum Source field, it contains the potentiality of all possible states or conditions in the universe. It is just the ancient way of saying it, and it turns out to be physically provable. The ancient model coincides with state-of-the-art physics. The 10 spheres and 22 paths yield a total of 32 planes of reference, like the Vector Equilibrium. This "tree" was first described in writing in the Sephir Yetzirah, or The Book of Formation. Legend says the book came to Abraham, from God, through an angel. Today, we might say it was "channeled" from a divine source. Jewish scholar, Gershom Scholem dates the workaround the third to sixth century. However, there is some astronomical evidence that the system does date from the time of Abraham, approximately 4,000 years ago. Whether the patriarch was the first to receive the revelation, or not, this archetypal consciousness map encodes a system of spiritual wisdom and growth in geometrical form. It describes the nature of the universe, consciousness, and the creation. It seems to have intuitively anticipated the discovery of the physical nature of reality. The glyph itself was used as a meditation devise by students of the Qabala, an oral wisdom tradition. One aim of the qabalists was to see the Tree always, everywhere, in everything. Another essential doctrine of Qabala is that humans possess a "spirit body" that can detach itself from the physical body and ascend to higher planes. Most modern students of Qabala are familiar with the standard 2-dimensional representation of the Tree, which is drawn "flat," even though the circles are always conceived of as spheres. There is also a long tradition of a so-called 4-dimensional Tree of Life diagram, based on The Book of Formation. This geometrical figure consists of two interfacing pyramids surrounding a central core, within an enclosing cube.This octahedron-within-a-cube happens to be the crystal structure of diamond, a face-centered-cubic lattice. Recalling that Abraham is also the patriarch of the Moslems, it is interesting to note reference to a spiritual body, a "diamond body", in the writing of Shaikh Amad Ahsa'i from the 13th century. Speaking of a substance akin to that of the medieval Philosopher's Stone, he equated the "diamond body" with the "Resurrection Body" of the faithful believer in the Paradise of the future Aeon. For the Qabalists, meditation on this figure provided a mystical body as a vehicle for consciousness in imaginal space. This diamond body was used during meditation to enter the inner court of Divinity, symbolized by the center of the figure. Here the Beginning and End of time are co-temporaneous, space ceases to be a hindrance, and the mystic beheld the ecstatic vision of the Lord on His Throne. The geometry was a "gateway" to another dimension of experience.This Alpha-Omega point has all the physical qualities of Vector Equilibrium. The ancient meditation practice was known as Merkabah mysticism, and those who practiced it called themselves, "Riders in the Chariot." They claimed to see into the future. This insinuates that the figure is a "vehicle" for moving consciousness through imaginal time and space. It seems to be a metaphysical "time machine," or inter-dimensional gateway.As in most design or mandala meditations, the aspirant pictures him or herself at the center of the figure through visualization, contemplation, and identification. Through this process of centering, these mystics came to know themselves and God. Perhaps they learned, as Fuller later discovered, of the unusual anomalous conditions of perfect equilibrium. This meditation provided a specific technique for escaping from time. Its realization meant instantaneous enlightenment, a paradoxical leap out of Time. It yields transcendence.Occultist, Paul Foster Case published an array of this type in his book, The Tarot (1947). Aware of the ancient mystic practice, he included the figure in his study of Qabala, calling it alternately the Key of the Cosmos and Numbers, or the CUBE OF SPACE. Again, we have the form of the octahedron-within-a-cube. Vector Equilibrium and the Cube of Space are mathematical duals, or reciprocals of one another. They "jitterbug" back and forth as the figure grows outward to fill all space. They are two ways of looking at the same geometrical phenomena. Case pointed out that its construction was based on the six-pointed Star of David, (or Shield of David), also known as "The Star of the Macrocosm." His descriptors of zero as a sacred, empty, consciousness field reiterate the qualities of Vector Equilibrium. Zero is a symbol of the absence of quality, quantity, or mass. Thus it denotes absolute freedom from every limitation whatever. It is a sign of the infinite and eternal Conscious Energy, itself No-Thing, though manifest in everything. It is That which was, is, and shall be forever; but it is nothing we can name. Boundless infinitely potential, living light, it is the rootless root of all things, of all activities, of all modes of consciousness. In it are included all imaginable and unimaginable possibilities, but it transcends them all. The Qabalists call it: (a) No-Thing; (b) The Boundless; (c) Limitless Light. Pure Conscious Energy, above and beyond thought, to us it is Superconsciousness. With their fascination for completely regular figures, the Greeks devised a way of establishing XYZ coordinates within a cube. Our science and method of orientation has been stuck with that model ever since. However, nature's own most economical coordination is in triangles and tetrahedra, rather than squares or cubes. Vector Equilibrium is more in line with modern Quantum Mechanical models and vacuum physics than the Newtonian XYZ. It expresses more degrees of freedom. So, close examination of the underlying geometry of the Tree of Life reveals that the ancients were not lacking a very deep intuitive awareness of the true structure of matter and the universe. The underlying geometrical matrix of the multi-dimensional Tree is, in fact, Vector Equilibrium. To find the commonality -- the harmony --the figure of the V.E. must be subjected to a transformation process, i.e. rotation.To bring the two figures into synch, simply rotate the V.E. to any edge of its containing cube. If the 3-dimensional V.E. is drawn flat, the inherent geometry of the Tree of Life is immediately revealed, including some of the so-called "hidden" paths. A symbolic representation of the optimal union of opposites, it means in psychological terms, "holding the tension of the opposites." This is the essence of the Tree of Life. The theme of union of opposites has reverberated down through the ages. It was the process/goal of alchemy, creation of the Philosopher's Stone.Now, Jungian psychology carries the torch of this philosophical pursuit. Both Vector Equilibrium and the Tree of Life express this most elegantly and economically in terms of minimal graphic elements.Diagram of Tree of Life nested within a Vector Equilibrium. By combining the vectors of a V.E. nested within a cube, it is possible to derive the nexus points on which to construct the entire Tree of Life. In The Anatomy of the Body of God, (1925), Frater Achad, (magickal name of Charles Stansfield Jones), revealed an amplified Tree of Life projecting from a center in six directions.Rather than a flat depiction, his revelation showed Trees radiating in the four cardinal directions, plus up and down. This is another variation on the theme of XYZ coordinates. Yet, V.E. can be shown, once again, to be the skeletal matrix on which the figure congeals. The geometrical duals yield all the necessary nexus points to form the entire Tree of Life, including the 11th mystery sphere, Daath. Achad's advice for modern Qabalists says,...since the "Tree" is everywhere the same in every part of space, once its general attributions are fixed in the mind, it is not well to confuse ourselves by too much attempt at progressed expansion of the idea. Rather we would return and contemplate the Center from which All proceeds, thus obtaining the Pure Essence Here and Now. pristine state of consciousness where All becomes No-Thing. These systems are virtually pre-geometrical. They don't really exist in nature, per se. Yet they are the invisible lattice, or bare bones, of our physical and spiritual life, of all life and manifestations. In this pre-geometry we have a blueprint for the formation of all matter, all form. This is the geometry of closest-packed spheres in the nucleus of the atom.Yet, Vector Equilibrium is more than an expression of nuclear forces. It is "an endlessly interlinked chain of atomically self-renewing links of omni-equal strength or of an omni-directionally interlinked chain matrix of ever renewed atomic links, "according to Fuller. No single configuration of matter persists indefinitely. All is change and recombination. V.E. describes the most economical lines of movement within the atomic nucleus. And, it also is the structural matrix of a very ancient and sophisticated consciousness-changing technology. Through it we remember deep knowledge of our true nature. Noting the metaphysical aspect of physics, physicist Wolfgang Pauli said, "We should now proceed to find a neutral, or unitarian, language in which every concept we use is applicable as well to the unconscious as to matter, in order to overcome this wrong view that the unconscious psyche and matter are two things. "We have, in the V.E. model, a language or information transfer system that bridges both the physical and the spiritual, Fuller says, "In this model the physical and metaphysical share the same design." The mundane and supernatural share the same design: "As Above, So Below." It creates a mystical revelation described as ecstatic, blissful, joyful, transcendental. Through every nerve, my veins are glowing. Creative nature spread in front of me. Your mind is closed, your heart is dead. Each living in the other's soul. How heaven's powers climb up and descend. Passing the golden pails from hand to hand! Is ringing through the world. In Aion, psychologist Carl Jung reiterates the identity of psyche and matter: Psyche cannot be totally different from matter, for how otherwise could it move matter? And matter cannot be alien to psyche, for how else could matter produce psyche? Psyche and matter exist in the same world, and each partakes of the other, otherwise any reciprocal action would be impossible.To know ourselves is to know the nature of cosmos. The yogis and masters tell us that matter is mind or consciousness at its most fundamental or gross level. From the dawn of history mankind has employed sacred geometries for metaphysical orientation and creating consciousness maps. Most maps of the psyche imply a "journey" either to the heights or depths of experience. Long ago Heraclitus alleged, and mystic artist William Blake agreed, that the way up and the way down are one and the same. Riders in the Chariot rose to a plane above the Throne to gaze down on its resplendent beauty.Metaphysical models usually speak of an ascent to utopian heights or "inner planes." Psychological models are usually concerned with descents into the subconscious depths and use subterranean imagery. These depths were the familiar territory of shamans for millennia. Both the occult and transpersonal psychology models include heights and depths of human experience. Maslow introduced the concept of "peak experiences" to psychology. This old system of orientation and modeling the universe, with its ascents and descents of the soul, was adequate for many years. However, for the modern individual, with a consciousness that is not earth-bound, the old hierarchical model is no longer the best metaphor. Today we are not confined to the spectrum of reality dictated solely by our finite senses.We are directly aware of physical realities ranging from the sub-atomic to the cosmic. Our perceptions are amplified with technology. New ways of seeing lead to new philosophical perspectives. We can align our mystical worldview with physical reality. The true nature of physical reality remains a mystery. Even for physicists, it has an elusive quality. No one really knows just what a quantum, a photon, or an atom "really is" or what it is doing when we're not looking at it. Physics is another interpretation of reality. We have become aware of a vast physical dimension without and an equally vast realm of psyche within. They are available for exploration. And there are ancient and modern technologies which aid us here. In terms of modern orientation and consciousness models, an omnidirectional system allows more degrees of freedom. This freedom is a conceptual, imaginal, and physical reality.Buckminster Fuller said that in whole systems the directions are always out and in. "In and out are the relevant directions, not up and down." Models or maps based on "in and out", rather than "up and down", allow us to conceive of particular states or conditions. As a metaphor, "in and out" is a typical characteristic of the phase states of matter. It is either in or out of phase or synchronization. During observation, matter is either in solid physical existence (particle) or out of solid physical existence (wave). This wave-particle duality exists within us all. This uncertainty surrounding substantive existence leads to paradox. We cannot grasp one part of nature without another part slipping through our fingers. Photons, neutrons, and even atoms have no definite form until they are measured. Wave-particle duality is a mystery. However, this primal characteristic of atoms, and the energy exchange in their cores, is the basis of our physical existence. The emergence of stable matter requires the balancing of tendencies toward implosion and explosion. This is the function of Vector Equilibrium.Physicist David Bohm modeled an "in and out" universe of implicate (in) and explicate (out) order. Yogis focus on the in and out breath during pranayama, and the experience connects them with cosmic time. The psychological tendencies, introversion and extroversion, express the polarity in ways of being. In cybernetics there is input (I) and output (O), the direction of the signal determining if it is I/O or O/I. Vector Equilibrium is the most economical model using geometry to express the ultimate union of the opposites. It creates the paradoxical state that is neither in nor out, up nor down, neither this nor that.For Fuller, the balancing of the tension of the opposites was achieved in his tensegrity sphere. It is stabilized dynamically to neither explode nor collapse. This original "Buckyball" is a tangible example of Vector Equilibrium. According to Fuller, "matter" itself is a contained explosion, and the Vector Equilibrium is its austere image. It is a system not a structure. It underlies structure or formation of something from apparent "nothingness." Vector Equilibrium is the lattice or invisible framework, and its blueprint is the cuboctahedron. In esoterics it is known as the Cube of Metatron and The Flower of Life. Its explicit form can enfold on itself until it compacts down into an octahedron, then a tetrahedron, the prime geometrical form. This is accomplished by doubling up on the vectors on the edges. This creates the difference, for example, between carbon, diamond, and silicon atomic structures. They are all face-centered cubic crystals. Coincidentally these elements are symbolic icons in our culture. They are the hallmarks of technology. A simple way to visualize the Vector Equilibrium is through the closest packing of spheres which underlies the geometry of crystal formation. Imagine a cluster of ping pong balls glued together, 12 around 1, then building out further and further. If you imagine vectors connecting the centers of each ball, IN THE THIRD LAYER you can find the Vector Equilibrium.The vectors that radiate out from the center are exactly equal to the vectors that bond the faces. No other structure can make this claim. This is the symmetry the Greeks missed, because it is an energetic process, manifesting force, not a thing. Vectors are not points in space traveling through time. Vectors map energy events. Time determines a vector's length -- the time it takes an energy event to happen. There must be time for wave functions to propagate. We know a musical note requires time to exist, because a note is nothing in an instant.Time is a duration. If we ask ourselves "a duration of what? ", we can only answer "...of nothing, or something." All "somethings" are composed of matter, and the nature of matter is consciousness. So time becomes a duration of consciousness. Energy is substance. Substance is energy at the quantum level. Our substance is energy, and consciousness is fully capable of quantum leaps. Fuller's energy mapping uses energetic triangles, in which three lines are not just lying there but are busy stabilizing the angles opposite them. Fuller describes the dynamic domain of "reality" as a broad spectrum of energy events, across a small portion of which our senses can "tune." Vector Equilibrium allows us to conceptually, metaphorically, and spiritually bridge the abyss between the mystical and scientific perspectives through sacred geometry. It is a key to the implicate and explicate order.